Samsung Electronics Co., the largest maker of cell phones for the U.S. market, on Sunday revealed the first phone running Samsung’s own “smart” software system, bada. With bada, Korea-based Samsung is taking the TouchWiz system used on its touch-screen non-smart phones and making it the basis of a smart phone platform to take on Apple Inc.’s iPhone and Research In Motion Ltd.’s BlackBerry. 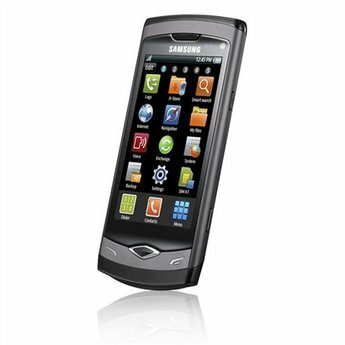 Samsung also makes phones based on other competing smart phone systems: Android, created by Google Inc., and Symbian, of which Nokia Corp. is a major backer. J.K. Shin, the president of Samsung’s phone division, said the goal of bada was to expand the market for smart phones, making them available to people across the world who have made do with non-smart phones. The new phone, dubbed the Wave, is a touch screen phone like the iPhone. It features a highly saturated, high-resolution screen using organic light emitting diodes, or OLEDs. Samsung said the phone will go on sale in April, but did not say if the U.S. would be one of the launch markets, nor did it say what the phone would cost. To support the Wave and existing phones using TouchWiz, Samsung is launching online applications stores in 50 countries this year, including the U.S. Most major phone makers now operate applications stores, or make phones that use stores administered by others, like Google. Samsung revealed the phone in Barcelona a day ahead of the start of Mobile World Congress, the world’s largest cell phone trade show.